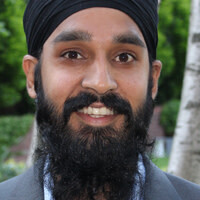 Darsh Preet Singh fought discrimination to become the first Sikh to play NCAA basketball. Now, he's waiting for the first turbaned player to break into the NBA. Growing up in South Texas, Darsh Preet Singh overcame adversity and discrimination to become the first turbaned Sikh to play NCAA basketball. The Smithsonian Institute is honoring Singh’s contributions by publicly displaying his jersey and sharing his story. Darsh Preet Singh had lots of sports heroes growing up, yet as he explains it, he was always aware that none of them looked like him. Darsh recalls entering high school as “that scrawny player with rec specs,” and over his four years, he sprouted up several inches, filled out in the weight room, and grew into a starring role on the varsity team. But the road was certainly not easy. Darsh served as team captain his senior year and collected various honors, and as his high school career wrapped to a close, he wondered about his basketball future. Darsh received little playing time as a “freshman walk-on,” yet he quickly endeared himself to the Trinity fans and became the fan favorite. At home games during his first year, every blowout win would end with chants of “We Want Darsh,” and the crowd would burst into raucous cheers when he would rise from the bench to check into the game. True to form, Darsh was not discouraged by the lack of playing time in his first year and committed himself to improving his game. Over the next three years, Darsh’s dedication and work ethic helped him earn an integral role on the squad, a leadership role as team captain, and the profound respect of his coaches and teammates. Another teammate, Michael Gilb, describes how he came to develop more respect for Darsh due to how he carried himself in the face of discrimination. Darsh realizes he has been seen as a role model for people of various backgrounds, yet he is still not fully comfortable with the idea. On Feb. 26, as he walked around Beyond Bollywood, the Smithsonian exhibit celebrating the greatest achievements of Indian-Americans in this country, Darsh reflected on how he felt like a child among giants. While Darsh sees himself as “regular guy who just loves playing basketball and serving his community,” his teammates across the board agree that—like their friendships with him—it’s about a lot more than basketball. Darsh shared a similar sentiment of challenging stereotypes and inspiring children while standing near his jersey in the Smithsonian. He also shared his vision for the future.